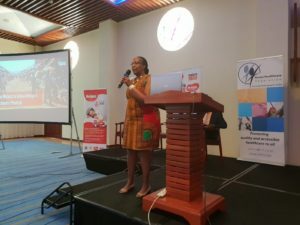 Kenya Healthcare Federation held the first members meeting on 28th February 2019 at Movenpick Hotel, Nairobi. The meeting was sponsored by Malaria no More. The theme of the meeting was ‘’End malaria to unleash Kenya’s economic growth’’ according to research and analysis, Malaria was the leading cause of death in the year 2017.The government has since made efforts to bring this under control. During the panel discussion, a major question asked was what is the private sector’s major role in malaria control and elimination . “100% of the supplies are produced from the private sector and a major concentration is on malaria treatment “.Dr. Amit N. Thakker, Chairman Kenya Healthcare federation. Dr. Thakker further informed the attendees that the private sector ensures that there is a malaria treatment are readily available at all facilities. How do we control malaria? by applying preventive and curative measures, carryout community sensitization and create awareness on the spread and prevention of malaria. During the members meeting, a major focus was paid to the 10th ministerial stakeholder forum and the inauguration of the NHIF reforms expert panel. Dr. Thakker updated the attendees that the Independent Panel of Experts will be required to skilfully develop an action plan that will see the transformation of NHIF into a strategic purchaser of health services, in the context of UHC. Inadditional, the KHF chair, reiterated Hon Sicily Kariuki’s stand on the continuously engagement between and the ministry of health to keep the public informed. 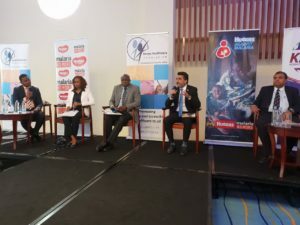 The Panel of experts will focus primarily on; Legal and Regulatory Reforms towards transforming the NHIF to be a strategic purchaser of health services, in the context of UHC, Organisational and Business process Re-engineering reforms towards repositioning NHIF as a National social Health Insurance provider,Fiscal and Social Accountability -Strengthening Financial and Social Accountability and Financial Sustainability-which will include the analysis of the sustainability of the NHIF under different financial and service coverage scenarios. the steps she has taken towards the reforms. He however promised the CS that the private sector will be working with the pilot counties on three key areas; supply chain, to make sure the medicines are available, affordable and of good quality, both locally produced and imported, Healthcare Financing, the expanded private sector insurance coverage and those in the counties will allow UHC in this counties to provide more coverage and better care and referral systems, he informed the ministry that KHF is ready to support the county referral instead of having many referral cases taken to Kenyatta National Hospital and Moi and Teaching referral hospital. Dr. Thakker and the entire KHF fraternity congratulates one of the directors, Ms. Joyce Wanderi, who was appointed into the expert panel, by the Cabinet Secretary.